I should have started this post a while ago. I picked up my first jet boat a few months ago, 76 Hallett bubble deck, and found out real quick the true meaning of "B.O.A.T." . The BBF had a few locked up cylinders which has since been pulled and replaced with a "rebuilt?" that I found for cheap. The interior has been destroyed by the weather from sitting uncovered in the high desert for a few years, but the gel has lasted fairly well. Testing a few areas with some wet sanding and polsihing brings the original red flake on white base back out. This should be a pretty nice ride once complete, If you guys have any tips on this hull let me know. I'll try to post some pics soon. It looks to be stock just painted by the guy I bought it from, what issues would I find with the Milodon? Nice thread Brandon, Ralph knows his stuff when it comes to Fords, I'm sure he'll go into some detail on the Milodon pan thing when he gets back on here. From what I recall, they typically fit like crap and they have been known to reduce oil pressure. I think I'm safe with the oil pan issue, pretty sure it's stock. The "new" engine was installed this weekend and looks like I'll have to add the same therm. block off plate due to the HEI clearence. Hope to have it plumbed next weekend and rewire after that, not in time for Tom Papp but there's always next year. 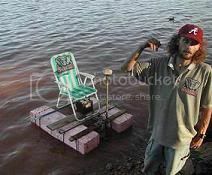 be verry carfull with that stock pan, i know the motor is installed and you want to make the tp deal but, i would put a jet boat pan on it first. Any suggestions on oil pan setups? he makes good pans, for a decent price but tends to be on back order often. TPM was pretty impressive and motivated me to get some more done on the Hallett. Here is the engine installed and water lines going on, also put together a inlet valve and hose fitting for trailer runs/cleaning. More progress this Sunday, removed interior and carpet to find a nasty glue residue which almost looks like mastic! Any suggestions for removing the remaining glue??? As soon as I can get the floor clean I will get carpet in and the next big step is to rebuild both seat frames. Also, finished the fuel line fabrication with stainless hardlines from the fuel pump to the carb. The water lines are about finished, just waiting on a few fittings and I can check for leaks. Always open for ideas so let me know if I've overlooked anything. Looking great! Maybe I should have went to TPM... I haven't touched mine in some time. diggin' the hardline work. So will that 12' shifter cable work for you? Sarah would like to take credit for the hardlines, I think because she realized that if she didn't leave me alone for a day this stuff wouldn't get done! As for the cable, I haven't measured what's on there but if it worked for you I'm sure it will go right on. I'll pull the old one off tomorrow and let you know, maybe I'll come see you this weekend and pick it up. This is the cable in need of some help. And please tell the boss I said thanks for letting you work on your boat......I guess. Thanks for the heads up GT, I will definitely change everything to grade 8 before I'm done. I was going to try Acetone on the adhesive, but it might take some sanding to knock it down. Does work well Gord! But i distrust anything as "environmentally safe" Agent Orange was supposed to be harmless, as was Sacarin......I could go on......They can make Pu$$y smell like an orange.......... in a nutshell, still use a mask! I check it out today, thanks for the info. Can anyone tell me the difference between marine carpet and the indoor/outdoor stuff at Home Depot? Is anyone using the indoor/outdoor stuff? hey haulsballs have the gray carpet fron lowes indoor outdoor its very flexable. also took my seats to AAA upolstery on 7th in victorville they did a great job and it was only like 400 bucks i will try to put a pic on here. Checked out the Citristrip at Home Depot and it says not to use on fiberglass, I know it was recommended but is there any real issue with using it? Any other suggestions to remove the glue adhesive from fiberglass? Started sanding most of the glue from the hull but there are still a few areas that need attention. Is there a specific resin I should use to recoat the hull after sanding? got it in mine. it works... but probably going to upgrade to some decent marine grade carpet soon. i got one of those "remnant" rolls for like $40. its not thick, you feel every bump, every seam, every crack, etc... so make sure you sand your floors smooth before putting down the carpet.